Download Baby Heartbeat Monitor app and connect it to the Fetal Doppler. The app will save all your recordings, allow you to share them with friends or play them over and over. It’s that simple! Do you want to listen to your baby’s heartbeat carefully and accurately via an FDA approved product? Our Fetal Doppler will allow you to measure and listen to your baby’s heartbeat precisely and accurately and to store your recordings safely in our app. Simply place the Doppler to the lower abdomen area and connect it to Baby Heartbeat Monitor. The Doppler is powered by a rechargeable lithium battery 7.4V and functions on an ultrasonic frequency of 2 MHz. Are you interested in knowing all you can about your baby’s health? It is now possible to order your Doppler via the Baby Heartbeat Monitor app. Don’t miss out on your chance to create an unbreakable bond with your unborn baby. It took some time and patience but I finally heard my baby’s heartbeat at 32 weeks! While trying I wasn’t always sure what I was hearing, but when I finally heard it, there was no doubt. I’m so excited, it’s awesome! Every day before I go to sleep, I turn up the baby monitoring app and listen to my baby’s calm breathing. It’s one of my favorite daily activities! Listen to your baby’s heartbeat in real time with the Doppler and enjoy the bonding moments with your baby. The Doppler connects easily via cable or Bluetooth to the app. 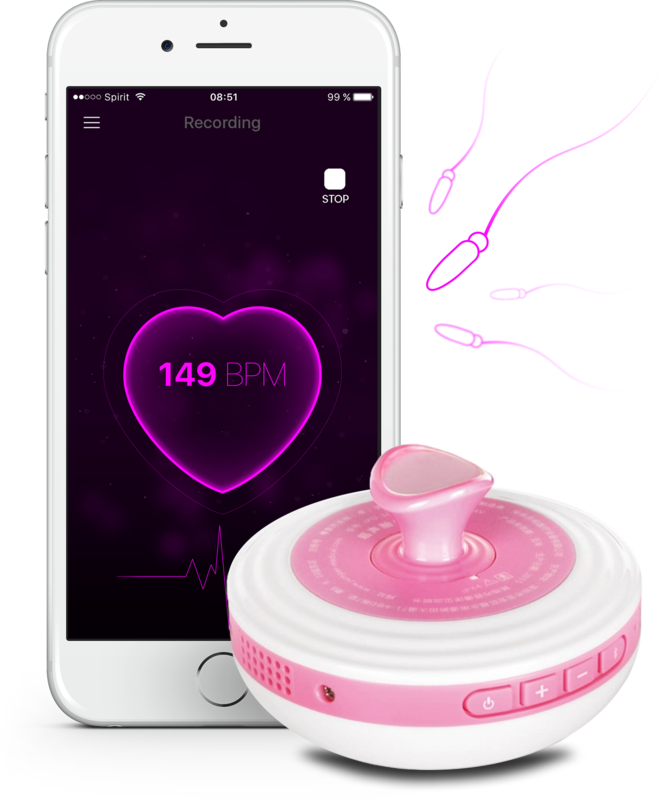 Record your baby’s heartbeat with the Doppler and store the recordings on your phone. You can revisit all your baby’s heartbeat recordings and play them whenever you want to. Share these precious moments with your friends and family. You can share all recording you make with your phone in the combination with the Doppler with your friends and family. Let the app walk you through your pregnancy week by week with information about the baby’s growth, changes going on inside the baby‘s body as well as the changes happening to you. Do you have a question? We would love to hear from you about any suggestion, request or feedback you may have. Can the mobile device radiation harm the baby? No. But if you want to make sure, you can turn your mobile phone to Airplane Mode when you record the heartbeat. After you’ve finished recording and want to share it, simply turn the Airplane Mode off. Does the app work without the Doppler? The app only works in connection to the Fetal Doppler. It stores all recordings you take with the Doppler and lets you share them with friends and family. How do I connect the Doppler to my phone? You have two options: via Bluetooth or via cable. Pairing via Bluetooth: Click the Bluetooth button on the Doppler and turn on Bluetooth on your phone to search for the Doppler. Once your phone discovers the Doppler, connect the two. Pairing via cable: Insert one end of the cable into the recording jack of the Doppler and the other end into the headset jack of your phone. What mobile devices does the app work on?